We awarded a grant of £5,300 to Mole Valley charity, Leatherhead Youth Project. 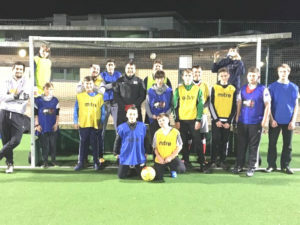 This grant funded their ‘Total Football’ programme, a weekly football project taking place for young people aged 11-17 on Friday evenings. This project is a key gathering point for local teenagers to engage them in a healthy activity and prevent them from taking part in antisocial behaviour on Friday nights. The project provides a fun, energetic and positive activity for young people, to play a team sport and keep healthy and active. The project also offers support from the team of youth workers and volunteers from Leatherhead Youth Project to build positive relationships with the group of young people, offering them advice, support and help with issues they are facing. This is particularly relevant for the beneficiaries that LYP are targeting, which mainly involves young people from disadvantaged backgrounds. The grant has also funded extra coaching that has helped young people develop their football skills and become more confident. Total Football has also benefited young people who want to be involved with volunteering, allowing LYP to set up a young leaders programme allowing those who have become too old to take part as a young person to sign up as a volunteer, receive training and be the future of the project. Ben* grew up living in a low-income, single parent household. He had limited opportunities and had to change schools, but despite this he was able to positively engage with LYP projects and begun attending the Total Football project 2 years ago. Ben is a very good player and the other boys looked up to him. LYP asked Ben to take on a position of leadership within the project and help the other boys with their skills and confidence. Bens behaviour and demeanour improved even more and he became a very positive role model. Ben was struggling with what to do next after school, with his GCSE exams set to take place June 2017. His options didn’t look very bright as a result of poor predicted grades and lack of motivation to study. However, in recent months one of the project leaders at LYP arranged for Ben to have a trial at the local football academy, which also offers a full time 2 year education course as part of the programme. Ben was accepted and will, with some hard work and consistent attendance, be in full time education for 2 more years. Ben has agreed to stay on at the Total Football project as a regular volunteer. We are delighted to have supported this project, and hope that more young people like Ben, can go on to further opportunities and a healthy lifestyle because of Total Football. Thank you for this support, it makes a huge difference. This project gives young people a safe, positive and healthy activity on Friday evenings which is hugely important in our community.